Repels mosquitoes within 10 minutes.Continuous protection from mosquitoes for 10 hours.Works with the windows open and lights switched on.Odourless & low irritant15 Nights protection. 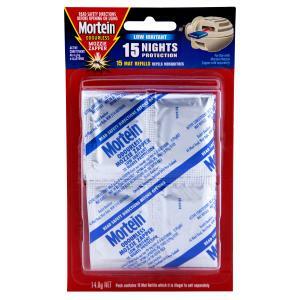 Mortein Mozzie Zapper Mat Refills use high quality ingredients to ensure odourless, low irritant protection from mosquitoes for you and your family, all night long. When turned on, the Mortein Mozzie Zapper starts repelling mosquitoes within 10 minutes. For use in conjunction with Mortein Mozzie Zapper plug-in unit.